Today, the Fukushima reactor's spent fuel rod pool reached boiling point, raising new fears that the pool's water will evaporate and the fuel rods will become exposed, which could lead to dangerous radiation emission levels. Last week the IAEA warned that if the reactor continued to emit radiation, the health hazard to the USA may have to be reassessed. Before Japan's nuclear crisis, the world was facing a less hyped, although potentially even more dangerous nuclear crisis -- the threat of a nuclear Iran. An unstable, whimsical, boisterous dictator was engaging in a covert nuclear weapons program, while calling freely to wipe the Jewish state off the map -- and the world barely blinked an eye. Isn't it interesting then, to discover that the two nuclear crises are related. The Japanese deputy foreign minister said Japan supports Iran's nuclear energy program and added that Iran has the right to use nuclear energy for peaceful purposes. He went on to say that Tokyo is determined to develop ties with Tehran. 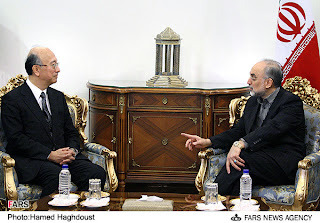 Salehi and Koro also discussed the latest regional developments and called for the expansion of cooperation between the two countries in all spheres. What exactly are the latest regional developments? Iran suppressing democratic protests? The threat of Iranian-funded terrorism taking hold in the new chaos facing the Middle East? Gaza firing Iranian rockets on Israel? Where exactly are the regional developments that create an environment conducive between anything resembling the 21st-century world with one of the most oppressive and unstable regimes on the planet?! Under the alleged compromise fuel swap deal that Japanese diplomats quietly briefed U.S. officials on earlier this month, some 70% of Iran’s low enriched uranium stockpile would be moved to Japan, according to what one Washington source, speaking anonymously, was told by the Japanese. Japan would then take responsibility for the stockpile, and ensure the delivery to Iran of fuel rods for nuclear medical use. In addition, in November, a Japanese diplomat, Yukio Amano, succeeded Mohamed ElBaradei to become director general of the IAEA, in effect the top international nuclear negotiator in the world. The Government of Japan deplores the decisions of the Government of Israel to give permission for the construction of 1,600 housing units in East Jerusalem in addition to 112 units in West Bank just after the Israeli and Palestinian leadership’s acceptance of the start of indirect talks. The Government of Japan does not recognize any act that prejudges the final status of Jerusalem and the territories in the pre-1967 borders. Japan demands that the plans should not be implemented. One message does seem to be clear from recent disasters: hey, idyllic countries far off there: stop using your God-given blessings to pick on Israel. God's kingship in today's world may be the most hidden it has ever been, but those with a pure and deep faith, a faith bequeathed to us from our ancestors, rooted deep in the the Jewish soul, cultivated throughout the ages precisely for days such as these, know without a shadow of a doubt that lo yanum v'lo yishan Shomer Yisroel -- no, the Guardian of Israel does not slumber! -- and even though galus feels like a state of slumber and abandonment, we know without a doubt that God is right here, about to save us from all our enemies, as present and as real as He was when He spoke to our people at Sinai, aware of our suffering and clearing the way for our geulah. The days are near when all the words of all the prophets regarding the Jewish people -- and the fall of their enemies -- will come true before our very eyes. May it be so speedily in our days.